After a four-day search, Moore, Okla., police have charged a man and his brother, their mother and the mother’s boyfriend with murdering a pair of 21-year-old black men, sawing the bodies into pieces and tossing the dismembered corpses into a nearby pond. According to WJLA-TV, when Alize Ramon Smith and Jarron Moreland were reported missing April 14, family members, neighbors and authorities began searching frantically for the two men. Four days later, on April 18, police discovered their severed bodies in a pond. Law enforcement officers arrested three people the same day: 42-year old Johnny Shane Barker, 22-year-old Kevin Garcia-Boettler and 16-year-old Brett Garcia-Boettler. Police later arrested Crystal Rachelle Boettler, 40, Kevin and Brett’s mother. According to court documents, Kevin Garcia-Boettler told police that he drove his younger brother to a grocery store parking lot to purchase a firearm from Moreland after Brett arranged the gun sale on Craigslist. After killing Moreland and Smith, Garcia-Boettler and Brett took the bodies to a nearby house, where they met up with their mother’s boyfriend, Barker, who helped them clean the van. 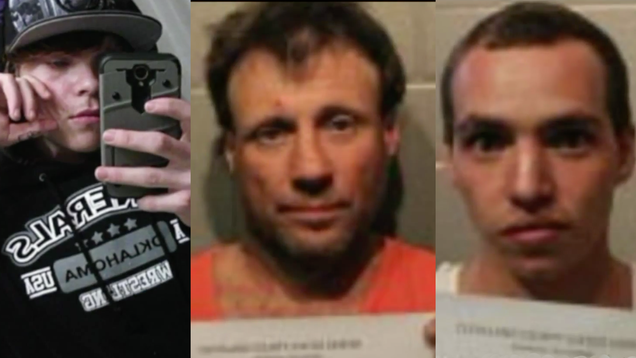 Then all three men allegedly removed Moreland’s and Smith’s clothes, burned them in a barrel, tied the deceased men’s bodies to cinder blocks and tossed them into a pond. KFOR reports that the police found the white Chrysler Town and Country Chrysler van surrounded by cleaning products and a power washer. The inside of the van was splattered with blood, and a chainsaw and jigsaw were soaking in water. Police later searched the pond with the family outside the property and found the dismembered corpses tied with tarp and attached to cement blocks in the water. Brett is charged with first-degree murder, second-degree murder, unlawful removal of a dead body, desecration of a human corpse and possession of a firearm after delinquent adjudication. Garcia-Boettler is charged with accessory after the fact and unlawful removal of a dead body. Barker is charged with accessory after the fact, unlawful removal of a body and desecration of a human corpse. Crystal Boettler is also charged with accessory to second-degree murder after the fact. “We’re just glad that we get some closure and we found him,” said Moreland’s uncle Anthony Anderson as he waited nearby while police recovered the bodies.